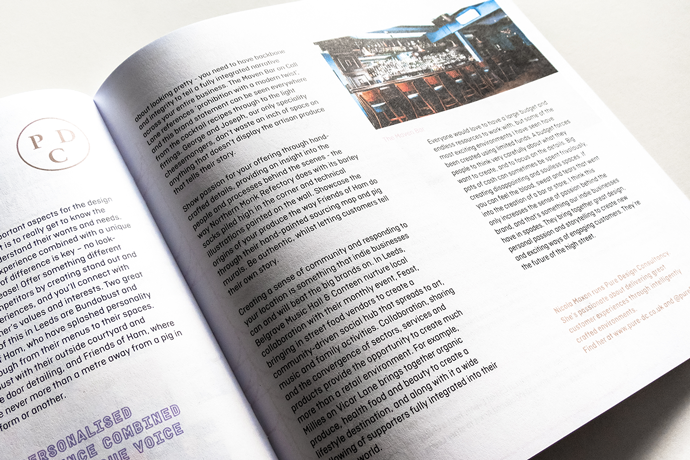 A few months ago I wrote a little article for Leeds Indie Food which was featured in their Extended Festival Programme for #LIF15 (designed by the very talented Hungry Sandwich Club). If you didn’t manage to get a copy here it is! Plans are already underway for #LIF16 and I can’t wait to see what they have got in store! 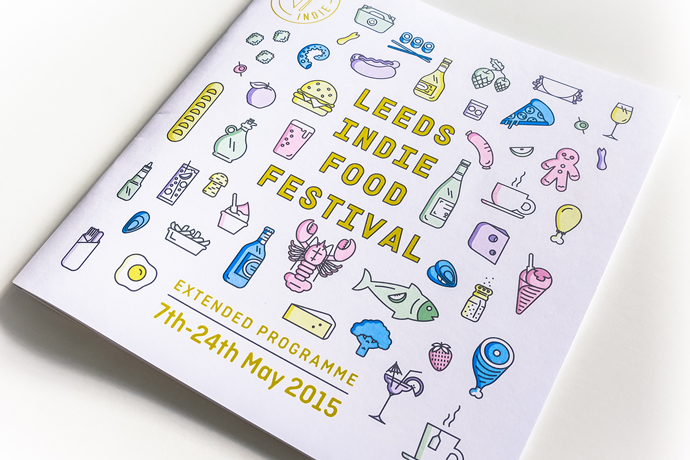 Leeds is very lucky to have such an amazing indie food scene and it’s just going from strength to strength! We do love our food up north and its the best around! Follow Leeds Indie Food on twitter, instagram and facebook to keep up to date with all the amazing things they are getting up to! Ensuring any business is successful on today’s high street is an ever-increasing challenge. Consumer habits are not what they used to be, which means it’s more important than ever to create an exciting and engaging retail environment. The high street has become more of a social experience than a transactional one, and businesses can no longer rely on traditional ways of engaging with customers. There are, however, huge opportunities – especially within the food and drink industry – to explore new avenues and interactions. Let’s take a look at how businesses in Leeds are leading the way. One of the most important aspects for the design of any environment is to really get to know the customer and understand their wants and needs. A personalised experience combined with a unique voice and point of difference is key – no look-a-likes here please! Offer something different from your competitors by creating stand out and ownable experiences, and you’ll connect with your customer’s values and interests. Two great examples of this in Leeds are Bundobust and Friends of Ham, who have splashed personality right through from their menus to their spaces. Bundobust with their outside courtyard and vintage door detailing, and Friends of Ham, where you’re never more than a metre away from a pig in one form or another. Storytelling is another integral part of the customer experience. It’s something that can engage and create a sense of passion. It even helps to turn your customer into a loyal brand ambassador – sharing the story you created with their friends, family and colleagues. Its not just about looking pretty – you need to have backbone and integrity to tell a fully integrated narrative across your entire business. The Maven Bar on Call Lane references ‘prohibition with a modern twist’, and this brand statement can be seen everywhere from the cocktail recipes through to the light fittings. George and Joseph, our only speciality cheesemongers, don’t waste an inch of space on anything that doesn’t display the artisan produce that tells their story. Show passion for your offering through hand-crafted details, providing an insight into the people and processes behind the scenes – the way Northern Monk Refectory does with its barley sacks piled high in the corner and technical illustrations painted on the wall. Showcase the origins of your produce the way Friends of Ham do through their hand-painted sourcing map and pig murals. Be authentic, whilst letting customers tell their own story. Creating a sense of community and responding to your location is something that indie businesses can and will beat the big brands on. 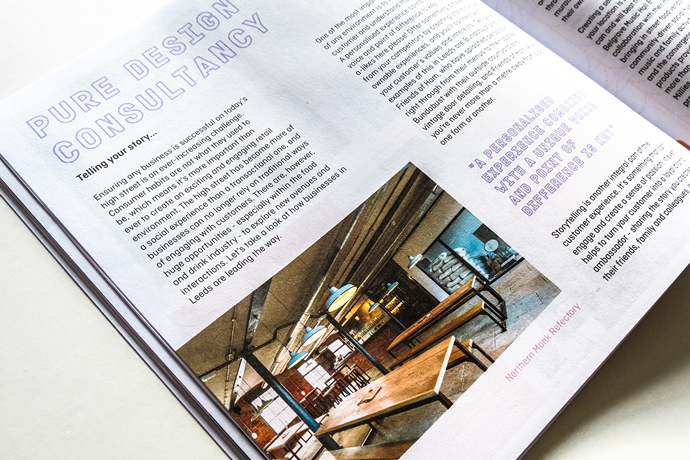 In Leeds, Belgrave Music Hall & Canteen nurture local collaboration with their monthly event, Feast, bringing in street food vendors to create a community-driven social hub that spreads to art, music and family activities. Collaboration, sharing and the convergence of sectors, services and products provide the opportunity to create much more than a retail environment. For example, Millies on Vicar Lane brings together organic produce, health food and beauty to create a lifestyle destination, and along with it a wide following of supporters fully integrated into their brand’s world. Everyone would love to have a large budget and endless resources to work with, but some of the most exciting environments I have seen have been created using limited funds. A budget forces people to think very carefully about what they want to create, and to focus on the details. Big pots of cash can sometimes be spent frivolously, creating disappointing and soulless spaces. If you can feel the blood, sweat and tears that went into the creation of a bar or store, I think this only increases the sense of passion behind the brand, and that’s something our indie businesses have in spades. They bring together great design, personal passion and storytelling to create new and exciting ways of engaging customers. They’re the future of the high street.